The Man in Space National Historic Landmark Theme Study has been prepared for the Congress and the Secretary of the Interior's Advisory Board in partial fulfillment of the requirements of P.L. 96-344. The purpose of the Theme Study is to evaluate all resources which relate to the theme of Man in Space and to recommend certain of those resources for designation as National Historic Landmarks. The Theme Study considered the Space Program in an integrated fashion. In any given space mission thousands of scientists, technicians, and other support personnel were necessary to insure success. These support personnel performed vital work in a variety of ways using support facilities in many parts of the country. None of these personnel in all likelihood comprehended all aspects of each space mission, yet all were vital to the success of the program. Since individual missions lasted over many years and involved a wide variety of resources and people only a few managers at the National Aeronautics and Space Administration (NASA) were able to see all of the facets of the space program. It was this coordination, cooperation, and collaboration that enabled NASA to successfully manage the American Space Program. The theme study follows this same approach and attempts to identify, inasmuch as is possible, the surviving resources of those that were necessary to accomplish the goals of landing a man on the moon and exploring the earth, planets and solar system. NASA's origins can be traced to World War I and the realization that although America had invented the airplane we had fallen behind in the technology of aeronautical research. In 1915 President Woodrow Wilson signed into law a Bill establishing the National Advisory Committee for Aeronautics (NACA) to remedy this situation. NACA began work in 1920 with the establishment of its first field officethe Langley Memorial Aeronautical Laboratory in Hampton, Virginia. As the years passed and significant wind tunnel research was accomplished at Langley, NACA perceived the need for additional research facilities. In 1939 NACA established its second field centerthe Moffett Field Laboratory, in California, later called the Ames Research Center. Like Langley, Ames was primarily devoted to wind tunnel testing needed to support the growing American aircraft industry. In 1940 NACA established its third field center, in Cleveland, Ohiothe Lewis Research Center. The purpose of Lewis was also to support aeronautical research with special emphasis on the development of newer, more efficient engines. By the late 1940s NACA also had established two flight test centersthe Auxiliary Flight Research Center at Wallops Island, Virginia and the NACA Muroc Flight Test Unit at Edwards, California, later renamed the Dryden Flight Research Center. Also established during these early years were the U.S. 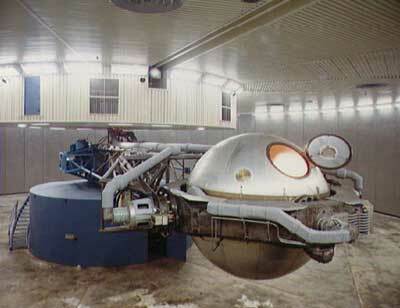 Naval Research Laboratory in Washington, D.C., and the Guggenheim Aeronautical Laboratory at the California Institute of Technology, later called the Jet Propulsion Laboratory. Both of these centers were soon concerned with research involving rocket technology. After the Second World War the interest of the Army in rockets as battlefield weapons led to the importation of many German scientists who had worked on the German V-2 program. This group, led by Dr. Werner von Braun, was first stationed at Fort Bliss, Texas and later reassigned to the U.S. Army Redstone Arsenal, in Huntsville, Alabama. The army group at the Redstone Arsenal eventually evolved into the George C. Marshall Space Flight Center. After the launch of Sputnik 1 and the much publicized failure of the American Vanguard Rocket, Congress passed the National Aeronautics and Space Act of 1958 that brought into being the National Aeronautics and Space Administration (NASA) and the modern American Space Program. When NASA began business on October 1, 1958, the process of consolidating the many pieces of the American Space Program was initiated. 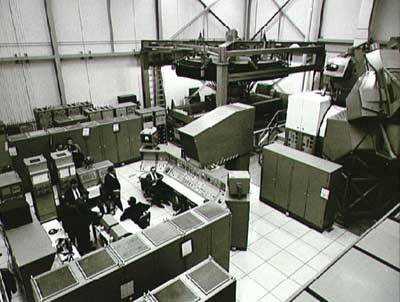 By 1963, when the process was completed, NASA consisted of the following field centers. Ames Research Center, Moffett Field, California: Ames continued its work in furthering aeronautical research using its fine wind tunnel complex. 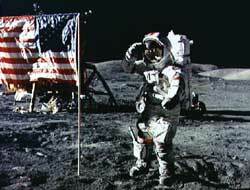 Its role in the Space Program was limited to the management of the Pioneer series of Spacecraft; space environmental physics; simulation techniques; gas dynamics at high speeds; configuration, stability, structures, and guidance and control of aeronautical and space vehicles; and biomedical and biophysical research. Hugh L. Dryden Flight Research Center, Edwards, California: Dryden supported flight testing of general aviation and high performance aircraft and spacecraft; flight operations and flight systems; and structural characteristics of aeronautical and space vehicles. Goddard Space Flight Center, Greenbelt, Maryland: Goddard developed from the Naval Research Laboratory after its transfer to NASA in 1958. The role of Goddard is in the scientific research of space with unmanned satellites; research and development of meteorological and communications satellites; and tracking and data acquisition operations. The Goddard Space Flight Center also manages the Goddard Institute for Space Studies in New York City which conducts research in astrophysics, planetary physics, and atmospheric physics. George C. Marshall Space Flight Center, Huntsville, Alabama: Marshall developed from the U.S. Army Redstone Arsenal rocket program under Dr. Werner von Braun. After the transfer of Dr. von Braun and his group to NASA, Marshall continued to work in the research and development of launch vehicles and systems to launch manned and unmanned spacecraft; development and integration of payloads and experiments for assigned space flight activities; and application of space technology and supporting scientific and engineering research. Marshall is most famous for the development of the Saturn family of rockets Marshall also managed the Michoud Assembly Facility in New Orleans, Louisiana where the giant Saturn V rocket first stage was built and the Slidell Computer Facility in St. Tammany Parish, Louisiana, which handled computer data processing for both Michoud and the National Space Technology Laboratories. Jet Propulsion Laboratory, Pasadena, California: The Jet Propulsion Laboratory was transferred to NASA from the U.S. Army in 1958 and developed into NASA's primary center for the exploration of the moon, planets, and solar system. JPL also manages the Goldstone Tracking Station which is responsible for the tracking and data acquisition systems necessary to communicate with spacecraft exploring deep space. JPL is operated for NASA under contract with the California Institute of Technology. John F. Kennedy Space Center, Florida: The Kennedy Space Center in cooperation with Cape Canaveral Air Force Station supports major NASA launches. All moon flights originated from Launch Complex 39 at this site. The Kennedy Space Center also manages the NASA Western Test Range Operations Office at Vandenberg, California, which was responsible for the integration, test, checkout, and launch of unmanned light and medium vehicles and the White Sands Test Facility in Las Cruces, New Mexico, which supported developmental and operational tests of spacecraft propulsion and power generating systems. Langley Research Center, Hampton, Virginia: Langley was the first NACA field installation and thus the oldest NASA center. Through the use of its fine complex of wind tunnels and other facilities Langley supports research in aeronautical and space structures and materials; advanced concepts and techniques for future aircraft; aerodynamics of re-entry vehicles; and space environmental physics, and improved supersonic flight capabilities. Langley has also provided major support for most aspects of the Space Program including Projects Mercury, Gemini, Apollo, the Space Shuttle, and the Viking Project. Lewis Research Center, Cleveland, Ohio: Lewis is another of the original NACA field offices that was transferred to NASA in 1958. Lewis was responsible for power plants and propulsion; high energy propellents; electric propulsion; aircraft engine noise reduction; engine pollution reduction; and data bank research information in aerospace safety. The most significant achievement of Lewis was in pioneering research that led to the development of hydrogen as a rocket engine fuel and in the development and testing of new materials for spacecraft and aircraft. Lewis also manages the Plum Brook Operations Division at Sandusky, Ohio, where many of its larger testing facilities are located. Lyndon B. Johnson Space Center, Houston, Texas: The Johnson Space Center was created after the formation of NASA to manage the American Manned Space Program. Johnson pioneered in research and development of manned spacecraft systems; development of astronaut and crew life support systems; development and integration of experiments for space flight activities; and application of space technology, and supporting scientific, engineering, and medical research. Johnson was recently designated as the lead NASA center in the development of the manned space station. Wallops Flight Center, Wallops Island, Virginia: Wallops was another of the original NACA field installations that transferred to NASA in 1958. Wallops was responsible for launch facilities and services to other NASA installations which conduct suborbital, orbital, and space probe experiments with vehicles ranging from small rockets to the Scout four-stage solid fuel rocket. National Space Technology Laboratories, Bay St. Louis, Mississippi: The National Space Technology Laboratories (Mississippi Test Facility) was responsible for static test firing of large space and launch vehicles such as the Saturn V rocket. Electronics Research Center, Cambridge, Massachusetts: The Electronics Research Center was responsible for conducting research and developing advanced technology in the area of space and aeronautical electronic components. It was closed in 1970. Nuclear Rocket Development Station, Jackass Flats, Nevada: The Nuclear Rocket Development Station was responsible for conducting full-scale ground tests of nuclear reactors, engines, and flight stages for the nuclear rocket program. It was closed in 1974. Cape Canaveral Air Force Station, Brevard County, Florida: Cape Canaveral Air Force Station contains some of the earliest facilities associated with rocket experimentation and space exploration as well as active space-age installations for current military and NASA programs. Cape Canaveral is best known for its association with Projects Mercury, Gemini, and Apollo as well as the launch site for most satellites and deep space probes during the early years of the American space program. Edwards Air Force Base, Edwards, California: Edwards Air Force Base is the site of the Air Force Flight Test Center which conducts new and follow-on testing of aircraft and related avionics and weapons systems. Edwards is also the home of the Air Force Rocket Propulsion Laboratory and the Air Force Test Pilot School. Edwards is presently the primary landing site for the Space Shuttle. Vandenberg Air Force Base, Lompoc, California: Vandenberg Air Force Base is the site of the 1st Strategic Aerospace Division, Western Space and Missile Test Center Space and Missile Test Organization, and the Shuttle Activation Task Force. 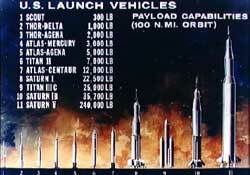 Vandenberg conducts missile crew training, and operates testing and launch facilities for the Strategic Air Command. In addition to the above NASA and USAF installations there were many contractor facilities that were important in the space program. These facilities were not visited during the course of this theme study. It is not known what contractor facilities associated with the early years of the American Space Program survive. Additional facilities associated with Robert Goddard, the U.S Army White Sands Test Sites, and space hardware now in the collection of the Smithsonian Institution will be visited and assessed during Phase II of the Man in Space Theme Study. Cape Canaveral Air Force Station was designated a National Historic Landmark on April 16, 1984. 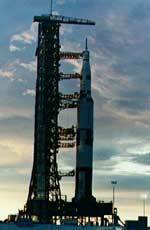 Launch Complex 39 at the Kennedy Space Center was listed on the National Register of Historic Places on May 24, 1973. The 24 recommended resources contained in this phase of the Man in Space Theme Study represent only a small fraction of the technological resources that were necessary to support the American space program. They are recommended for designation as National Historic Landmarks because they represent the best and most important surviving examples of this technology. Due to the rapid change of the space program and evolving technologies, support facilities simply do not survive or survive in a greatly altered state. The efforts to land a man on the moon, investigate the near Earth environment, and explore the planets and solar system were supported from a technological base that reflected a depth and variety of support facilities that were unprecedented in American history. Many of these resources have long since been destroyed, abandoned or altered to meet the changing demands of the space program. The 24 facilities reflected in this theme study are but a fraction of this resource base. They are the best, most intact, and most important resources that have survived. Their variety and range reflect the much larger technological base that provided the foundation of the space program. It is hoped that this selection will survive to interpret for future generations the early years of the American space program. All photos used on this page courtesy of NASA.